In 1633, John Winthrop Jr. led a group of settlers to the Native American area known as Agawam, and began building the town that they would name Ipswich. They chose a spot with half-billion year old granite outcroppings as a worthy location for their meeting house. 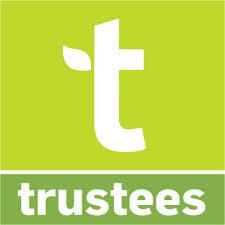 It is still known today as Meeting House Green, or North Green. Yet most of the landforms in our town were formed less than 20,000 years ago. When the supercontinent Rodinia broke up 750 million years ago, the Laurentian craton became the early North American continent. Other pieces reassembled in the Southern Hemisphere into a new supercontinent, Gondwana. 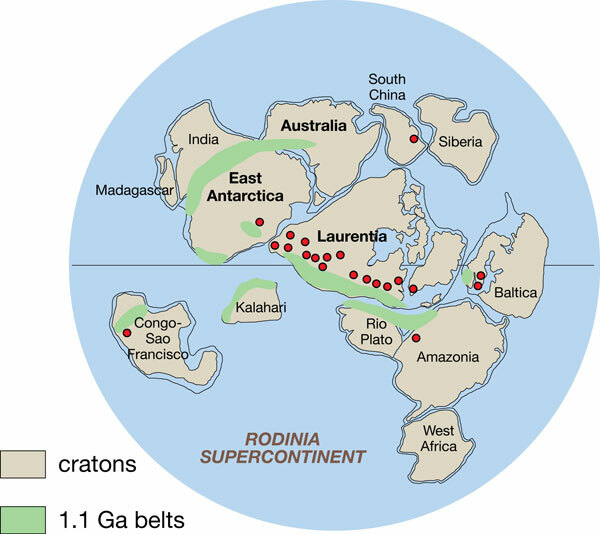 Eventually Gondwana reunited with Laurentia to form Pangaea, the third supercontinent. The early stages of this collision created the Appalachian chain, including the Taconic mountain range that separates Massachusetts from New York State. The breakup of Pangaea 200 million years ago defined today’s North America and created the Atlantic Ocean. The Merrimack, Nashoba, Avalon and Meguma terranes that make up the eastern half of Massachusetts are believed to have been volcanic island chains that broke off the super continent Gondwana and collided with Laurentia between 550 and 370 million years ago. Ipswich and Cape Ann are in the Avalon Terrane , which was part of the microcontinent Avalonia during the Paleozoic era.The granite underlying the Avalon land mass crystallized while the volcanic chain was still attached to Gondwana. Moraines are linear mounds of debris that build at the toe of the glacier. Cape Ann is broadly defined as the rocky 160 square mile area between Rockport, Danvers, Ipswich and Manchester by the Sea, and is a terminal moraine. Eskers are long sinuous ridges of debris deposited by streams of glacial meltwater. Various trails in Willowdale State Forest, Appleton Farms near Cutler Road and the Ipswich River Sanctuary follow the crest of eskers. Drumlins are elliptical hills formed when moving ice scrapes glacial material as it moves over it, eventually leaving a tear-shaped pile up to 200′ high when the the glacier recedes. The Necks, Castle Hill and Bar Head at the southern tip of Plum Island are excellent examples of Drumlins. Glacial erratics are large boulders carried by the glaciers. These are most obvious in the area from West Gloucester to Rockport. Till is the unsorted glacial debris deposited directly under the glacier. It constitutes much of the soil in this area. The animation below shows the ebb and flow of the Ice Ages over the last 120,000 years. The timeline in the upper right corner is measured in thousands of years before the present (kaPB). The sheer weight of mile-high glacial ice caused our 450,000 granite bedrock to sink. 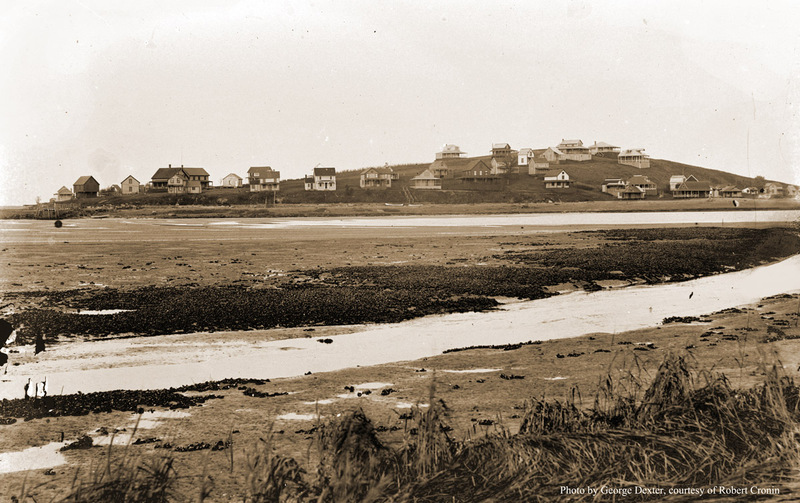 Then as the glaciers melted, the sea level rose, putting much of the North Shore under water. As the ice-free land began to decompress and rebound upwards, the ocean receded to the shoreline we see today. Much of the surface soil in our area was deposited during the post-glacial period by these events. Marshland, drumlins and bedrock hills mix with broad flat areas of marine sand, gravel deposits and glacial till, creating the landscape of Ipswich and the North Shore area today. 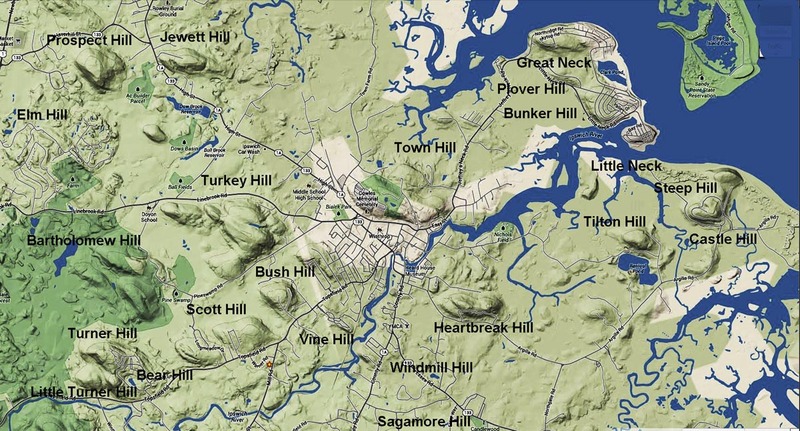 The Topsfield hills, Great Neck and Castle Hill are but a few of the local geological features left by the retreating glacier. Native Americans began moving into New England after the retreat of the Wisconsin Glacier, around 12,000 BC. In the early 1950’s, a group of young amateur archeologists men now known as the “Bull Brook Boys” discovered one of the largest Paleo-Indian sites in North America along the banks of the Egypt River in an area being cleared for a sand and gravel operation on Paradise Road. The photo above is a view of Heartbreak Hill taken from the roof of a building on North Main Street in 1879. The woolen mill is gone now, and Heartbreak Hill is covered with trees. The Ipswich River wraps around Town Hill, a granite monolith that is millions of years old, but most of the hills in Ipswich are glacial drumlins left as the ice age glaciers retreated about 20,000 years ago. Heartbreak Hill: off Argilla Road 164 ft.
Bedrock geologic map of the Ipswich quadrangle, 1698 By: William H. Dennen. Ordovician rock underlies the southern 2/3 which includes the town of Ipswich. 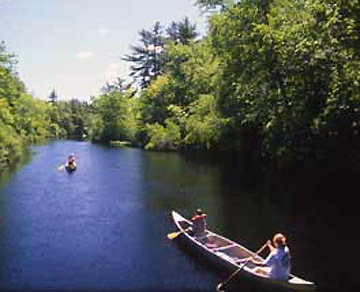 A minor fault follows the general course of the Ipswich River. 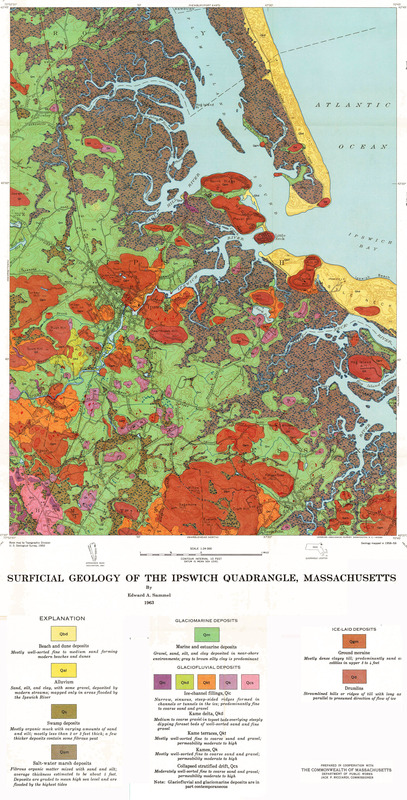 USGS Geological survey of the superficial geology of Ipswich. Yellows are beach, dune and alluvial sand and gravel deposits. Oranges are ice-laid drumlins and moraines. Greens are marine and estuary deposits, and pinks are glacio-fluvial deposits. The bedrock underlying these superficial deposits are two batholithic complexes from the Devonian and Carboniferous periods.